Last year’s crabgrass is dead and gone after any heavy frosts over the past few months. The seeds those plants left behind practically everywhere will germinate as your soil warms up. The good news is you can stop them from growing by putting down a Scotts Halts barrier that prevents them from geminating. 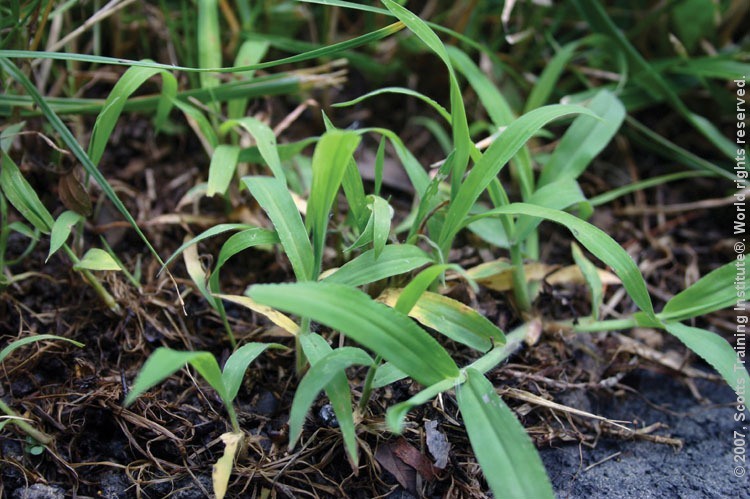 Even if you live in parts of the deep south and southern California where heavy frosts do not occur, you can prevent new crabgrass plants from growing from seed in your soil. The big question: When to apply? Experts say crabgrass germination starts when your soil temperature reaches 55 degrees for several days. Here is a link to a soil temperature tracking map that provides you up to date soil temps for your area. It is better to get your preventer down too early than too late. Crabgrass seedlings about a week after germination. Crabgrass gets its name because it sprawls from a central root low across the ground. It can become a problem quickly because it is able to grow vigorously in hot, dry conditions choking out your good grass. Before dying in the fall, a single weed can distribute thousands of seeds which will be ready to germinate in spring. For Florida: Apply by Mid-February. If you have dormant (brown-looking) Bermudagrass, Zoysia or Centipede grass you should use Scotts HALTS without the Turf Builder. If you have St. Augustinegrass you should use Scotts Halts now and then feed your lawn later with Scotts Bonus S Weed and Feed. For other Mid-South States: Apply by March 1. If you have dormant (brown-looking) Bermudagrass, Zoysia or Centipede grass you should use Scotts HALTS without the Turf Builder. If you have Fescue, use Scotts Turf Builder with Halts. For Texas: Apply by March 1 in South Texas, by March 15 in rest of the state. If you have dormant (brown-looking) Bermudagrass, Zoysia or Centipede grass you should use Scotts HALTS without the Turf Builder. If you have St. Augustinegrass you should use Scotts Halts now and then feed your lawn later with Scotts Bonus S Weed and Feed. For California: Apply by March 1 in Southern California and by March 15 in Northern California. Use Scotts Turf Builder with Halts. Thanks for your article, very helpful. Need your help. I live in East Tennessee and will be putting down Scotts TB Halts Crabgrass Preventer with Lawn Food in the next few days. I also would like to apply Ortho Weed-B-Gon MAX for broadleaf weeds. How many days should I wait after applying Scotts TB Halts before treating with Ortho Weed-B-Gon MAX. Thanks for your help. Suggest you wait a week. to spray the Weed B Gon after applying your Turf Builder with Halts. « California Drought – What Now?